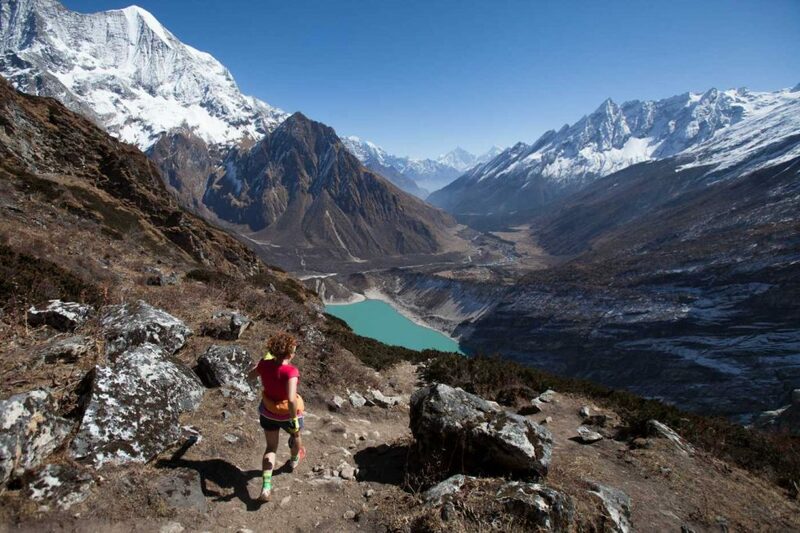 Natalia Roman-Lopez running down from 4500m. There are many races listed on this site. 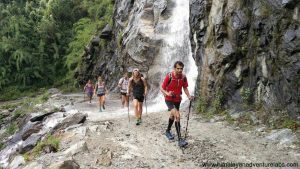 Trail Running Nepal organises this one! With four clear months to go, time to try to fill the last few places and by mentioning why this event is a great choice and clarifying a few things that people often ask. “For me it was really my best trail running experience since more than 20 years of trail running!” said Stephan Tassani-Prell in his feedback of the race. There are still a few places left – up to 8 more to be exact. – so if you’re considering joining in November, let us know quickly! Here are a few things you might like to know about the race. Some people see the images on the website and assume it is an event for elites. 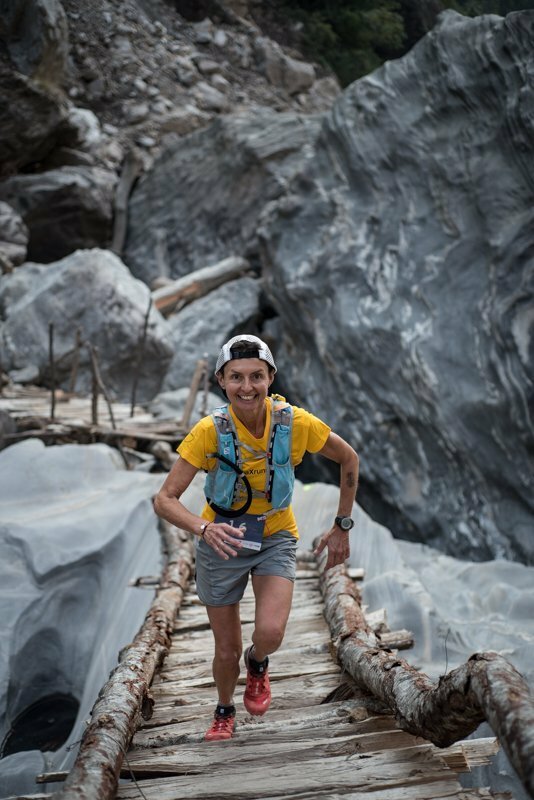 It’s worth spelling out that this is still a challenge but it is not about suffering – more about enjoying running through this amazing landscape, and enjoying the company of the people you’re with. You don’t have to carry a heavy pack – just your day’s running pack: energy, water and something warm to wear at the stage finish until your bags arrive. You’ll sleep indoors on a mattress every night, no tents or floors. You can really get some sleep and recover. We cook all the food for you and lots of it. No need to bring dehydrated meals, unless you want to. The longest stage is reduced to 32km this year. With the elevation change, altitude and day after day, most people are not wishing for more by the end. The field usually is a mix of regular, enthusiastic trail runners, with some accomplished runners and occasional (semi-)professional runners. The local runners we invite run to win! A few people come to hike the route. This time last year, after the earthquake, the race was fully in doubt. Along with great damage to buildings, the landslides damaged trails and continued to pose danger as the monsoon rains fell. It wasn’t until late September that we could conduct an assessment of the trails and hotels. By 1st October, when the rains had finally stopped, teams of local villagers were on the trails clearing new routes around or across landslides. This was positive news for the participants, and more so the race staff who were keen to get working and earn a living again. Tourism, and so work, had ground almost to a halt in this area and so we were pleased to be able to send our recce report to trekkers and agencies and play a part to get tourism started again. For the race, apart from a few makeshift bridges, the trails were good and hotels also in good condition. A few races do this, and more races should! How can four competitors in a race stage take time to do this? (Photo below.) Because it’s a check-in, check-out point. Certain places are too amazing and to allow you to enjoy them, we have a checkpoint where you can stay a while the clock is stopped. It’s the same rule for everyone and you can stay for 10 seconds, or 1 hour, it’s up to you. Below is Pungyen Gompa, a small monastery on a plateau at 4400m (14,500ft) with the enormous East face of Manaslu rising up nearly 4km from it. There is a second CICO checkpoint below Manaslu Basecamp where you can gaze at Manaslu across it’s glacier. 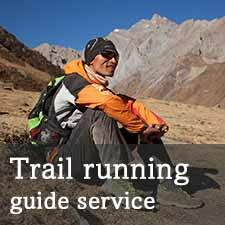 Like race organisers Les Chevaliers du Vent and the Everest Marathon, we invite local runners to Manaslu. Some for the racing experience, others just for the trip of a lifetime. 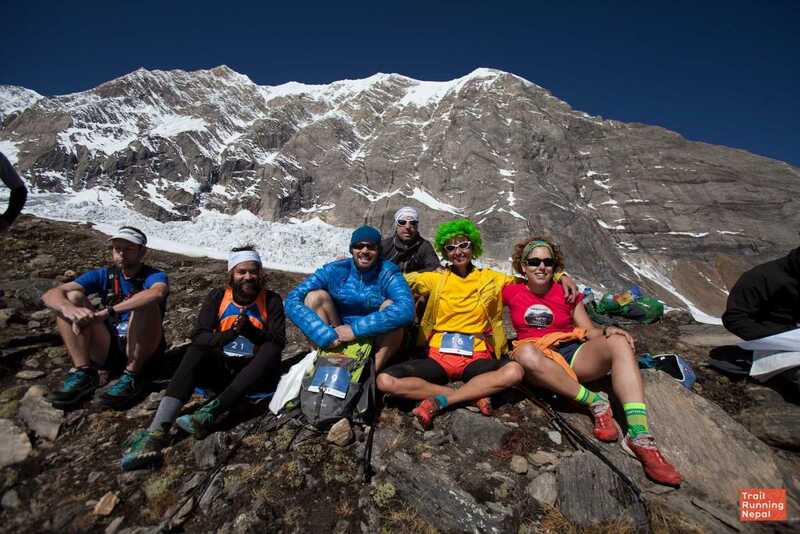 In 2015 two of the invited runners came all the way from remote Jumla – Bishnu Maya Budha and Dipendra Bam. Bishnu to go to Hong Kong! (c) Mark Brightwell. 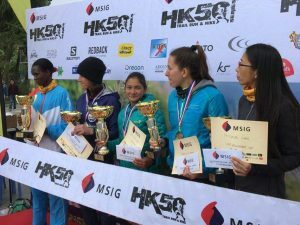 Bishnu ran really well, consistently stage after stage, so much so that we thought it was worth trying to send her to race in Hong Kong in December last year. 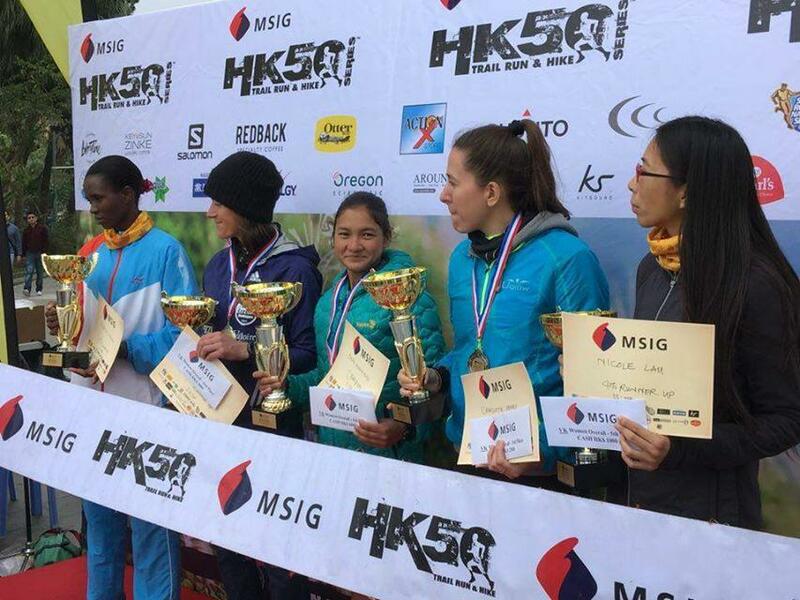 There she won the Vertical Kilometer and placed 5th in the 50km after a fall. She came home with more than US$1000 in her pocket and some great running shoes. 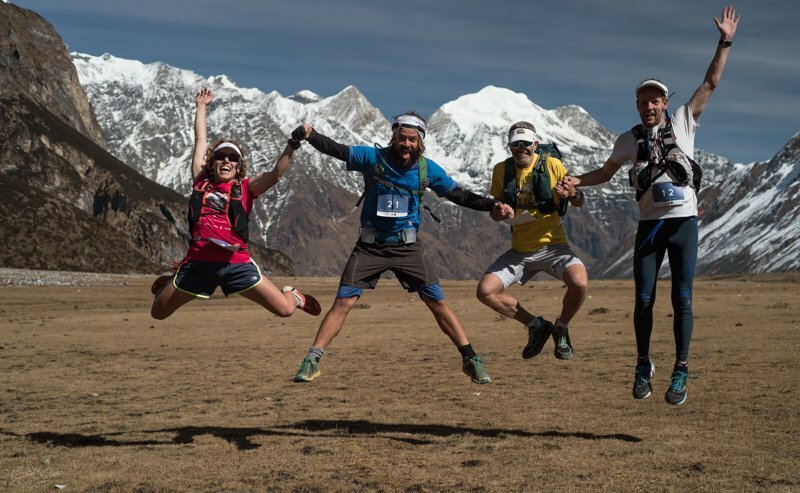 Dipendra and Bishnu later placed first at the Kathmandu Ultra in January and won a trip to China to run in the Yading Skyrace. It’s great to be able to help give opportunities like this to young talents. “Run for light” is the race’s strapline. Things are improving, but still many people lack access to electricity or light. The race itself makes a donation of solar lights in one of the villages we pass through in coordination with a charity that does this, and a sum for the maintenance of Samdo’s (highest Tibetan village in the valley) micro-hydro generator. To do a little bit more last year, we raised over $5000 for more lights – you can read below. We’ll be doing the same this year too. Look out for us soon featured in Sidetracked Magazine. Visit the website https://manaslutrailrace.org/ for more information. * Of course reverse for those in the southern hemisphere! Sorry. This entry was posted in Blog and tagged asian races, multi-day race, stage race. Bookmark the permalink.